Enjoy a lovable, huggable Christmas storytime with children’s book author Bernadette Rossetti-Shustak. 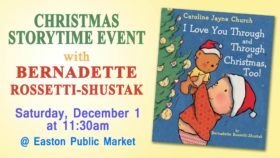 Bernadette will read from her new book “I Love You Through and Through at Christmas, Too” and leads children in a fun activity. Bernadette will also do a special storytime at Book & Puppet Co. at 10:30am. Bernadette Rossetti-Shustak (bernadetterossettishustak.com) is the author of “I Love You Through and Through” for which she was awarded an Oppenheim Toy Portfolio Gold Award for 2006. Bernadette is a former newspaper editor and journalist. She has worked for Housatonic Publications as co-editor of the Pawling News Chronicle, Pawling, NY, and Associate Editor for the weekly newspaper The Kent Good Times Dispatch, Kent, CT, Housatonic Home, and Business Digest magazines. She and her husband, Mike, have two grown children, and one grandchild, Maxwell Mercury. They live with their two cats, Mickey and Mattingly, in upstate New York. Book & Puppet Co. presents an interview with Heather Mayer Irvine, author of “The Runner’s World Vegetarian Cookbook” at the Easton Public Market. 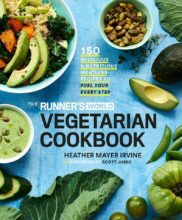 This cookbook not only contains 150 delicious meatless recipes but also in-depth information on how runners—regardless of their food-with-a-face preference—can eat more plants. Delicious and nutritious recipes for every meal (and yes, even dessert!) that will help power your runs and recovery. Heather is the Food and Nutrition editor of Runner’s World. She lives and runs in Bethlehem, Pennsylvania, with her husband, Jeff, and their son, Finn. Her work has appeared in Runner’s World, The Associated Press, Glamour, Discover, Health.com, The Huffington Post, and CNN. She has a marathon best of 3:31, half marathon best of 1:34, 5K best of 19:46, and 1 mile best of 5:33. Heather has never met a burger or ice cream sundae she didn’t like. For all you Martin Guitar lovers and music enthusiasts, enjoy some 100% locally-grown music with a special acoustic jam session featuring Martin Guitar and School of Rock Easton at the Easton Public Market. Easton School of Rock students will be jamming with Martin’s authentic acoustic strings and guitars as we pay tribute to the Valley’s legendary guitar maker. This week’s recipe: Hot Chocolate Cookies. 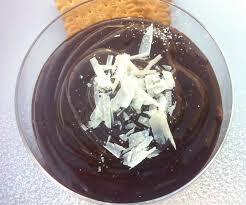 A cup of hot chocolate formed into a cookie topped with melted chocolate and a gooey-licious marshmallow. These cookies will have the children wanting to tuck themselves into a warm blanket while they enjoy the cookies!! Bring containers for leftovers. Don your ugliest holiday sweater and come eat, drink and be merry at the Easton Public Market’s Ugly Sweater Holiday Party. 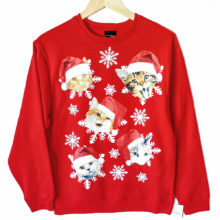 Dinner & drink specials, music with DJ Brad Scott Smith and lots of great prizes for the ugliest sweaters! Festive fun for the whole family!! This week’s recipe: Blizzard Cookies. Back by popular demand! 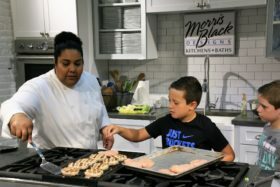 Kids had so much fun making these cookies last year we had to bring them back this holiday season. These scrumptious cookies have layers of white chocolate morsels with sparkly sprinkles and will most definitely make it feel like a white December! 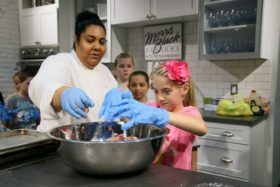 The Easton Hunger Coalition hosts the free public “Morning Conversation on FOOD” series at the Community Room inside the Easton Public Market. This Wednesday join a discussion on how climate change is affecting our food system. 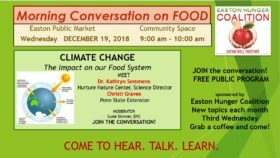 Dr. Kate Semmens of Nurture Nature Center and Christi Graver of Penn State Extension will be speaking along with members of the Easton Hunger Coalition. Easton Hospital presents Healthy Living Wednesdays in the EPM Kitchen! Join Nutritionists Alison Unger and Amy Romberger to learn about eating healthy throughout the year as they share tips and recipes on how to promote a healthy lifestyle. This Wednesday Alison and Amy will prepare two diabetic friendly holiday desserts: Greek Yogurt Chocolate Mousse and Orange Cookies, and will also talk about recipe substitutions during baking to increase the nutritional value and decrease carbohydrate content. Join us in welcoming John Bemelmans Marciano to the Easton Public Market for a reading and book signing of his new comic novel for middle-grade readers, The No-Good Nine. It’s 1931 in Pittsburgh PA and some very naughty children are about to set off for the North Pole. Their mission: to change Christmas forever. The Easton Public Market will be open on Monday, December 24, 2018 from 9 am to 3 pm for your last-minute holiday shopping. The merriest of Christmases to you and your family from the Easton Public Market. Now that the big day is over, head to the market for your favorite foods and treats, especially if you were lucky enough to receive an Easton Public Market or a Downtown Easton Gift Card — you can spend both at EPM!! Have a happy and safe New Year’s Eve from all of us at the Easton Public Market!